Coverage: Live on BBC Two (16:00 BST), Radio 5 live sports extra (15:25 BST), online, tablets, mobiles and BBC Sport app. South Africa's Cameron van der Burgh set a new world record for the men's 50m breaststroke in the heats at the World Swimming Championships. The defending champion's time of 26.62 seconds eclipsed the 26.67 he set at the World Championships in 2009. Britain's Adam Peaty swam 26.62 last August, but that time is still to be ratified because of an error in the blood-testing procedure. Peaty won the last of Tuesday's nine heats in Kazan, clocking 26.68. 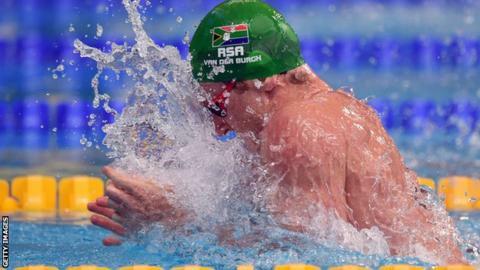 The 20-year-old, who beat Van der Burgh to win the 100m breaststroke title on Monday, said of his heat: "I just went out there and had fun and didn't take it that seriously. "There's definitely more in there." The semi-finals take place later on Tuesday, with the final on Wednesday. Peaty told BBC Sport: "I'm really confident. I missed a few strokes and I could be a little bit more powerful so it will be nice to get out there tonight and fully enjoy it." Van der Burgh is the first man to set a world record at this year's event, with four women having done so across the opening two days. His previous best was set when performance-enhancing neoprene suits were still permitted. The 27-year-old said he was "really happy" after the "bitter-sweet disappointment" of the 100m final. He added: "We are all so close, it's not going to be a one or two-horse race, there are a lot of guys in the mix and it's going to very tight." Siobhan Marie O'Connor, who won Britain's first world 200m individual medley medal with a bronze on Monday, is into the semi-finals of the 200m freestyle. The 19-year-old set the 11th-fastest qualifying time - finishing fourth in her heat in one minute 58.27 seconds. Stephen Milne clocked seven minutes 46.41 seconds to qualify third-fastest for Wednesday's men's 800m freestyle final.